"Jump" is a song by the American rock band Van Halen. It was released in December 1983 as the lead single from their album 1984. It is Van Halen's most successful single to date reaching number one on the U.S. Billboard Hot 100. 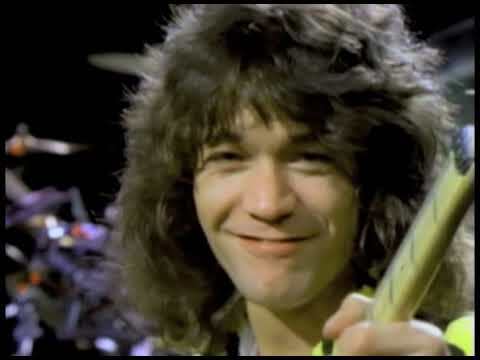 The song differs from earlier Van Halen songs in that it is driven by a rolling synth line (played on an Oberheim OB-Xa), although the song does contain a guitar solo, which was spliced together from multiple takes. The synth line was written around 1981 by Eddie Van Halen but it was refused by the other members of the band. In 1983, producer Ted Templeman asked Roth to take a listen to the unused song idea. Riding around in the back of his 1951 Mercury, with band roadie Larry Hostler driving, Roth listened repeatedly to the song. To come up with a lyric for it, he remembered seeing a television news report the night before about a man who was threatening to commit suicide by jumping off of a high building. Roth thought that one of the onlookers of such a scene would probably shout "go ahead and jump". Roth bounced this suggestion off Hostler who agreed it was good. Instead of being about a threatened suicide, the words were written as an invitation to love. Roth later told Musician magazine that Hostler was "probably the most responsible for how it came out." This stylistic change was further cemented when it seemed to create severe tensions between Eddie Van Halen and David Lee Roth. This conflict eventually ended in Roth's departure from the band. In the 1995 Rolling Stone cover story on/interview with Eddie Van Halen (RS #705, dated April 6) the circumstances surrounding Roth's leaving are discussed. In this interview Eddie claims that the main reason for the split was that Roth and Ted Templeman both disliked the fact that he had built his own studio and was able to work on music away from their influence. He said that "the first thing I did up here was 'Jump' and they didn't like it. I said 'take it or leave it', I was getting sick of their ideas of what was commercial ... At first Crazy from the Heat was great because Roth laid off me a bit. Little did I know he was testing the waters. Then he called me up and asked me to go to his house and said he was going to make a Crazy from the Heat movie. He had some deal that fell through. But at the time I was depressed. I cried, then I called my brother and told him the guy quit." The music video for "Jump" was directed by David Lee Roth. It is a straightforward performance clip, much like many of the hard rock videos of the time. It was nominated for three MTV Video Music Awards, and won "Best Stage Performance" for the video. The video was groundbreaking and set the standard for performance videos that directors still try to emulate. To produce such a video, the band is recorded performing the song several times from beginning to end. Then, the band members are shot doing random stage moves without the pretense of actually playing the song (note that Eddie is seen playing the guitar at times when no guitar can be heard). Some candid footage is shot with the band goofing around, and then the footage is edited into a video. The version of the song used for the video differs slightly from the album version. During the keyboard solo prior to the final refrain, David Lee Roth is heard (and seen) yelling out. He did this during the band's mock performance for the video's filming, and it is believed that afterwards he overdubbed this yell especially for the video version since it is not present in the song to begin with.